John McKone was born on June 16, 1932, in Kansas City, Missouri. He was commissioned a 2d Lt in the U.S. Air Force through the Air Force ROTC program on July 31, 1954, and went on active duty beginning March 15, 1955. After completing Navigator training and B-47 Stratojet Combat Crew Training, Lt McKone served as an RB-47 navigator with the 321st Strategic Reconnaissance Squadron at Forbes AFB, Kansas, until February 1958, when he joined the 319th Strategic Reconnaissance Squadron, also at Forbes. His next assignment was as an RB-47 navigator with the 343rd Strategic Reconnaissance Squadron at Forbes from July 1958 to January 1961, during which time his RB-47 was shot down by Soviet fighters over international waters near the Soviet Union on July 1, 1960, and he was captured and taken as a Prisoner of War. Capt McKone was released after 208 days in captivity on January 24, 1961. After returning to the United States, he served as a Special Assistant to the Commander of the 55th Strategic Reconnaissance Wing at Forbes AFB from January to August 1961, followed by an Air Force Institute of Technology assignment to complete his master's degree in International Relations at the University of Pittsburgh, Pennsylvania, from September 1961 to September 1962. Capt McKone next completed Intelligence Officer training, and then served as an Interrogator Controller with the survival school at the 3637th Combat Crew Training Squadron, Stead AFB, Nevada, from December 1962 to August 1964. He attended Air Command and Staff College at Maxwell AFB, Alabama, from August 1964 to July 1965, and then served as a navigator with the 7310th Air Base Group at Rhein-Main AB, West Germany, from July 1965 to May 1966. Maj McKone next served as a staff officer, special projects officer, and chief navigator with the Deputy Chief of Staff for Operations with Headquarters U.S. Air Forces in Europe at Lindsey AS, West Germany, from May 1966 to June 1969, followed by service as a staff officer with the Air Force Military Personnel Center Randolph AFB, Texas, from June 1969 to July 1973. 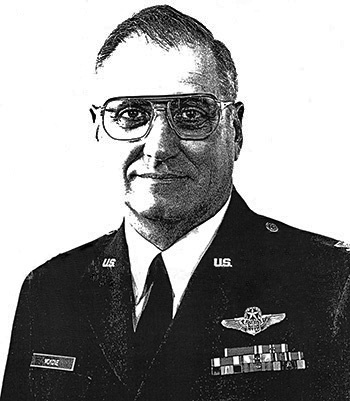 Col McKone next served as Deputy Base Commander of Spangdahlem AB, West Germany, from August 1973 to July 1975, and then as the Chief, Management Inspection Division with the Inspector General, Headquarters U.S. Air Forces in Europe at Kapaun AS, West Germany, from August 1975 to June 1978. His next assignment was as Commander of the 44th Combat Support Group at Ellsworth AFB, South Dakota, from July 1978 to June 1980, followed by service as Commander of the 3902nd Air Base Wing of the Strategic Air Command at Offutt AFB, Nebraska, from July 1980 until his retirement from the Air Force on September 1, 1983. John McKone died on October 31, 2013, and he was buried at Arlington National Cemetery. Colonel John R. McKone distinguished himself by gallantry in connection with military operations against an opposing armed force from 1 July 1960 to 24 January 1961. During this period, while assigned to the 343rd Strategic Reconnaissance Squadron, 55th Strategic Reconnaissance Wing, then Captain McKone was held captive in solitary confinement in the infamous Lubyanka Prison, Moscow, in the former Union of Soviet Socialist Republics, after his crew's RB-47 aircraft had been shot down by a Soviet fighter aircraft over international waters. For 208 days, Colonel McKone was interrogated and harassed at length on a continuous basis by numerous top Soviet Secret Police interrogating teams. Although greatly weakened physically by the lack of food, denial of sleep, and the mental rigors of constant interrogation, Colonel McKone steadfastly refused all attempts to give sensitive defense information or be exploited for propaganda purposes, resisting all Soviet efforts through cajolery, trickery, and threats of death to obtain the confessions they sought as part of the pretrial investigation. After enduring seven months of threats, insults, and unmentionable hardship, Colonel McKone was finally released to United States control. As a result of his indomitable spirit, exceptional loyalty, and continuous heroic actions, a "showcase trial" was never conducted, earning him the everlasting gratitude of his fellow prisoner and country as well as gaining respect of his Soviet captors. For his sustained courage and extraordinary leadership in an exceptionally hostile environment, Colonel McKone was publicly recognized at the highest levels of government, including the President of the United States. By his gallantry and devotion to duty, Colonel McKone has reflected great credit upon himself and the United States Air Force.